Planning a wedding requires a great deal of time and effort, but regardless of how carefully you plan your perfect day, there will always be factors out of your control, making wedding insurance a wise investment. What if your venue goes out of business? Or inclement weather forces your wedding to be postponed? What if your rings are lost or your photos are damaged? These are nerve-wracking yet realistic scenarios. Lost Deposits – If a vendor goes out of business, declares bankruptcy before your big day, or simply fails to show up, your wedding insurance policy can reimburse you for your lost deposit. Inclement Weather – Your policy can reimburse you for non-recoverable expenses in the event that severe weather forces you to postpone your wedding. Lost or Damaged Dress – New Hampshire wedding insurance can provide you with repair or replacement cost if the bride’s gown or the groom’s tuxedo or suit is damaged or lost. Sudden Illness – If a sudden illness forces your wedding to be postponed because the bride, groom, or their parents can no longer attend, you will have coverage for non-recoverable expenses. Lost Rings – If your wedding bands are damaged or lost, your wedding insurance policy can provide you with repair or replacement cost. Damaged Photos – If your photos are lost or damaged, your policy can help cover the cost of retaking new ones. Call to Duty – In the event that you are forced to postpone the wedding because the bride or groom is unexpectedly called up to active duty, or has her/his military service leave revoked, you can receive reimbursement for non-recoverable expenses. Damaged Gifts – Wedding insurance can also provide repair or replacement cost for damaged gifts. 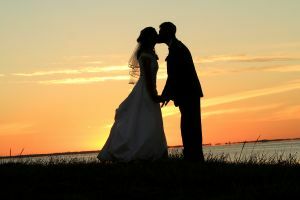 Get a Free New Hampshire Wedding Insurance Quote Today! There are several other scenarios wedding insurance can cover, and various coverage options available, such as adding liquor liability to your policy. If you’re planning a wedding in New Hampshire, you can rely on the agents at Eaton & Berube in Nashua, NH, to answer your coverage questions, explain the different options available to you, and help you secure a policy that will provide you with peace of mind on your special day. To get a free quote for New Hampshire wedding insurance, please call us today at 800-660-5362 or submit our online quote request form.